February 2, 2013 February 2, 2013 ~ Craig M.
Here’s an interesting exercise in turning process into a nearly tangible contributor to the art. Cellist Didier Petit teamed up with prominent North American musicians (Marilyn Crispell, Joe Morris, Hamid Drake, Larry Ochs….) in duos and trios, improvising to the sounds of a poem that we don’t get to hear (with the exception of one short passage). So, Alexandre Pierrepont’s poem, Le Jardin des Cranes, is reduced to context, like the walls or the weather. It’s the backbone of the entire album, but it’s invisible. 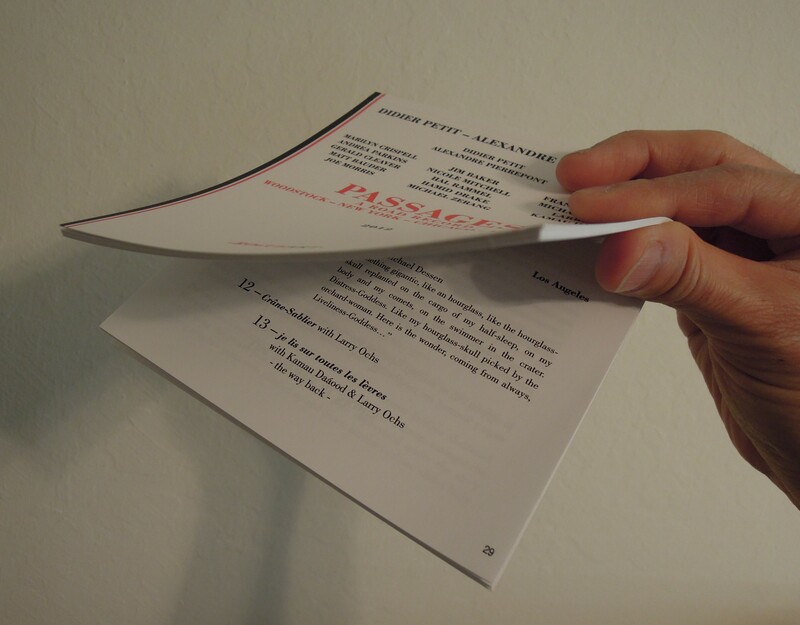 Everything about Passages is a discovery, starting with the packaging: It looks like a typical Rogue Art softpack until you tear the plastic off and realize you’re holding a 48-page booklet. The CD itself blends segues many of the music tracks together, often with an interstitial sound from Petit and Pierrepont’s travels (airplanes, street crowds, etc.) — creating a subtly shifting tableaux, like a long drive where you suddenly realize the scenery has changed. The music, excerpted from thirteen studio sessions, is a mix of lyrical moods and aggressive sparring. Here’s how it worked. For each session, a selection of the poem was chosen and translated to English. The guest musician(s) and Petit got acquainted, warmed up a little, then improvised — with the poem segment read into their ears multiple times, including one reading by a special guest (William Parker was one) who would read the French passage phonetically. The CD takes a few minutes from each session, with any part of the musical exercise being fair game. I love the intangible sense that the process is a major component of the art. What’s being presented is not just the music, but it’s surroundings, too. It’s the same feeling I get from the “Drawing Restraint” series of works by artist Matthew Barney. Not the movie with Björk in it, but the actual drawings that were the earliest stages of the project. He’d set up some ridiculous physical constraint, such as swinging from the ceiling of the San Francisco Museum of Modern Art, and draw. The MOMA example produced pencil drawings on a piece of paper attached to a wall; Barney had to swing over, draw, then swing back. The drawings themselves are a wreck, as you might imagine, and quite uninformative. It’s the whole process that gives the project the sheen of art. The music is not a wreck. It’s very good. There’s even a trajectory: It starts in stern tones with Andrea Parkins and Gerald Cleaver, followed by Chicago sessions that are quite sublime, such as the gentle, jazzy groove of Nicole Mitchell’s flute backed by Petit’s cello and singing. His piece with drummers Hamid Drake and Michael Zerang is like an ominous little tribal dance, full of tension and rhythm, topped off by some gruff vocal howling by Petit. François Houle, on clarinet, gets to represent Canada during the L.A. sessions. He’s got an extended dialogue with Petit that floats from lyrical tones to a choppy call-and-response. Bay Area hero Larry Ochs closes out the album with a session that includes the one time we get to hear the poem. The booklet is more than liner notes; it’s a template and a road journal. It includes a poetic textual “map” of the 13 studio sessions, the entirety of Pierrepont’s poem, and an explanation of the whole project, written by Yves Citton. And photos, of course, taken during Petit and Pierrepont’s sojourn from Woodstock to New York City to Chicago to Los Angeles. Passages is a wonderful pack of surprises and a good argument as to why the CD can still have a place in the digital world.